There are many benefits to using games and play in therapy. People tend to retain knowledge and insight gained when they are having fun in the process. I have been using Jenga® in groups and family sessions for 20 years. In this document I explain how I have used this game, my method and guidelines. I also include a list of topics and concepts for discussion and some possible goals for your clients. "A place where you will find quality therapeutic resources at a reasonable price. "I have worked with mental health and substance abuse clients in a variety of organizations since 1987 and I have noticed a consistent trend--a lack of therapeutic resources available at a reasonable price. I know if you produce resources for counselors and their clients you are serving a limited market and that means things generally cost more. The problem is many counselors and clients just don't have the money to buy everything they would like to buy. Agencies often don't have a large budget for resources. I want to help fill this void by providing resources at a reasonable price. 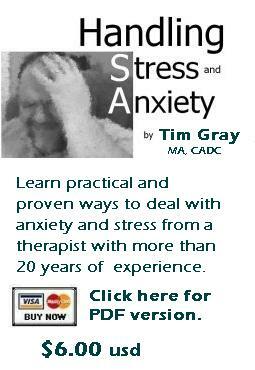 Click here to read more about Tim's eBook "Handling Stress and Anxiety" and see some sample pages or click on the graphic below to buy it now.